Ho, Ho, Ho! Happy Holidays to All!! This fun, quick and traditional card is easy to create with our Stampin' Write Makers, while supporting the Ronald McDonald House!! So Join Me in creating this 'Merriest Christmas' card and supporting families in one of their most difficult stages in life! 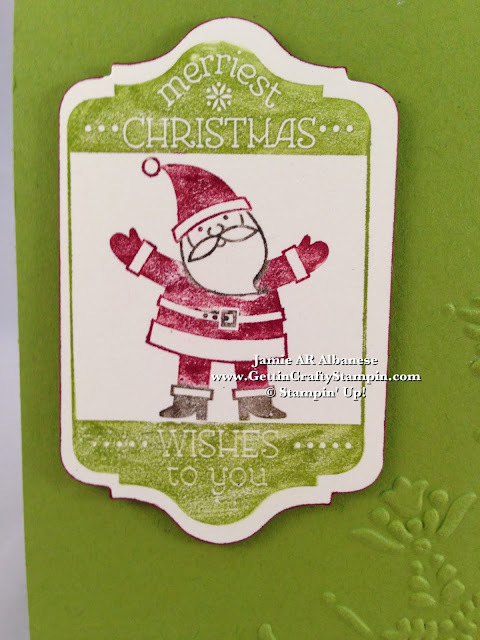 Using the Merriest Christmas Santa stamp from the Ronald McDonald Charities 'Tag It' stamp set and the Stampin' Write Markers, color in the darkest color to the lightest. Early Espresso colored the belt, boots and face. Cherry Cobbler the outfit and Gumball Green the sentiment. It's super easy with our high quality paint-brush, dual tipped markers... Click Here for more info on our amazing and affordable Stampin' Write Markers! 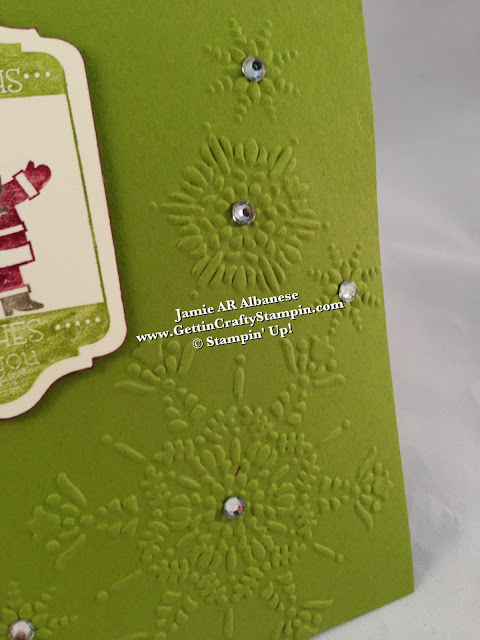 Emboss the Northern Flurry embossing folder and Big Shot. Add a dash of bling with the adhesive backed Rhinestone Jewels. POP This Santa and his Merriest Wishes out with the Big Shot, Magnetic Platform and our Chalk Talk framelits! 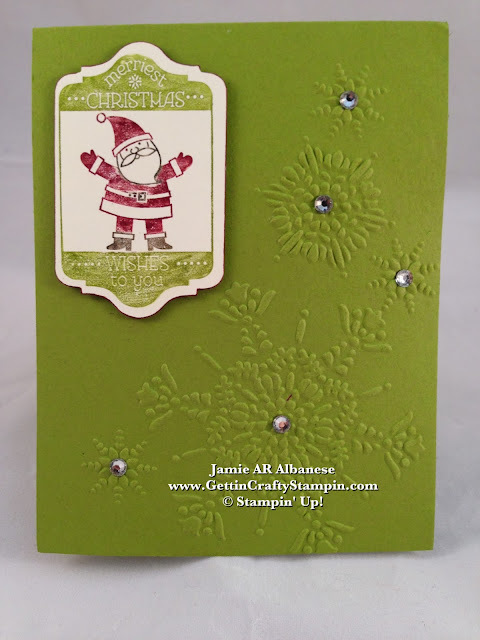 Add a small 'layer' with the aide of our Cherry Cobbler Stampin' Write Marker along the edges. It ads contrast and helps it to stand apart from the background while being tied into the color scheme. The Stampin' Dimensional Adhesive raises it up for an additional 'pop'. Celebrate the holidays while supporting those in need. The Ronald McDonald House Charities supports families by providing homes during life-saving treatment. Every Tag It stamp set sends a portion to support this amazing charity... and nothing is better than supporting others during the generous holiday season! I'm so very blessed that you came by today. I try to post daily and hope to see you back! Bring your friends and family along for the fun. 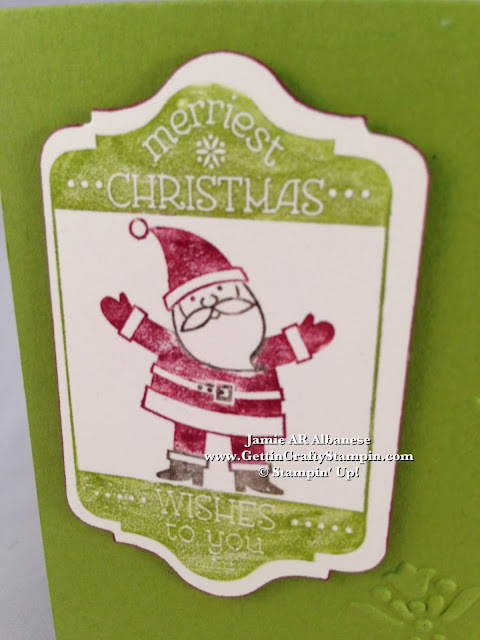 I love how our Stampin' Write Markers can color this holiday season! This quick technique really adds dimension and color to almost all stamps! Go ahead, grab your Stampin' Write Markers (or order some from me) and add some colors to this Christmas Holiday and Support families in their darkest hour!